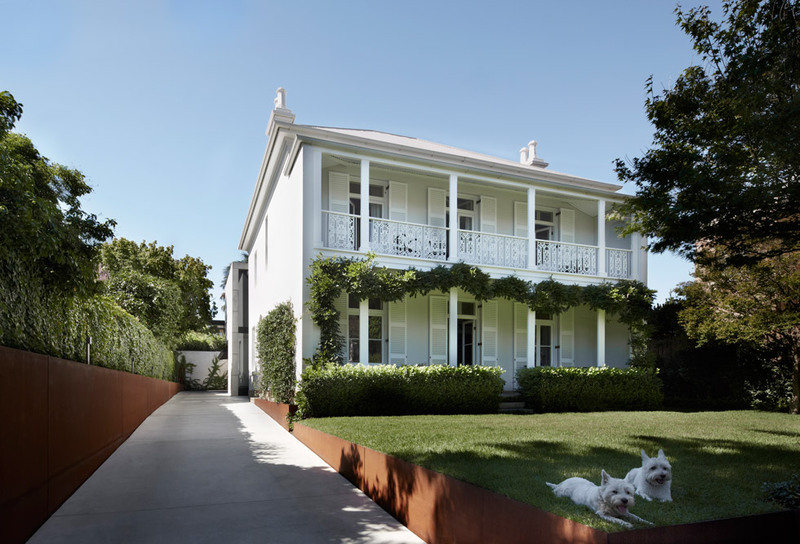 Orama is a late 19th century Victorian villa located in Ocean Street Woollahra. 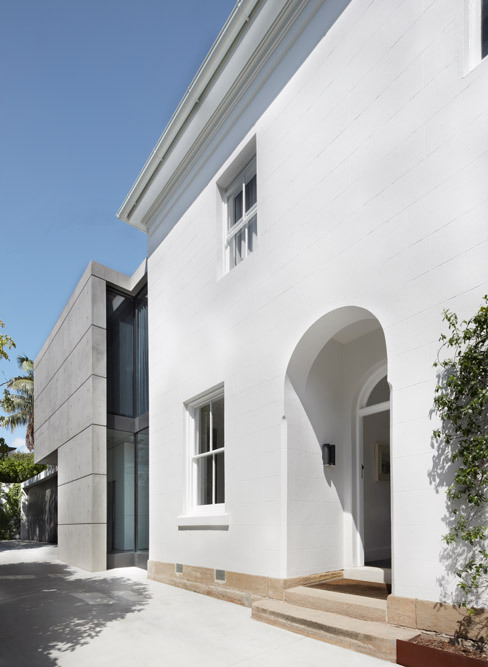 At the time of this most recent renovation, the front of the house had not been changed however the rear had been altered over the years with new sections having been added as required. The brief for the architects, Smart Design Studio, was to transform this rather tired looking terrace into a well-lit contemporary home. Their solution was to retain the best aspects of the house, namely the elegant front section, and to remove the darker less practical section at the back replacing it with a flat roof concrete extension. 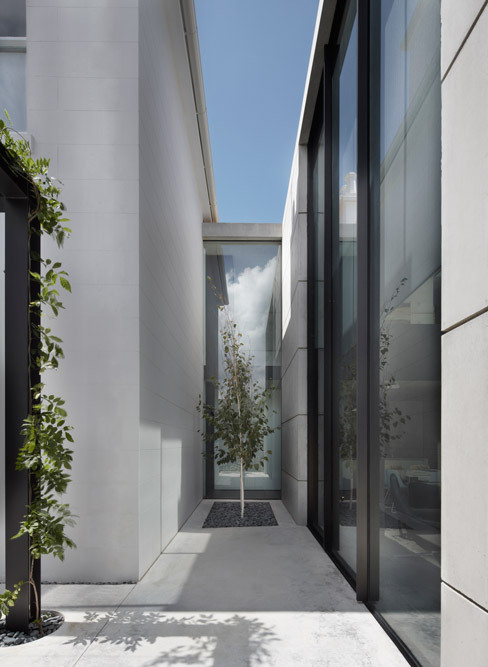 While it could be considered a fairly radical design response, it is very effective as the façade has been left intact and the modern addition is discretely hidden from the street. The smaller more intimate rooms at the front have become the bedrooms and rooms reserved for quieter pursuits such as the study and music room. The rear section was constructed with generously sized open plan living spaces connecting to the outside. Containing a double-height dining room, lounge and kitchen, it opens into the back yard where a plunge pool and garage have been added. According to the architect, “The form of the new wing takes cues from the blocky pattern-book forms of the villa ensemble of which Orama is part”. 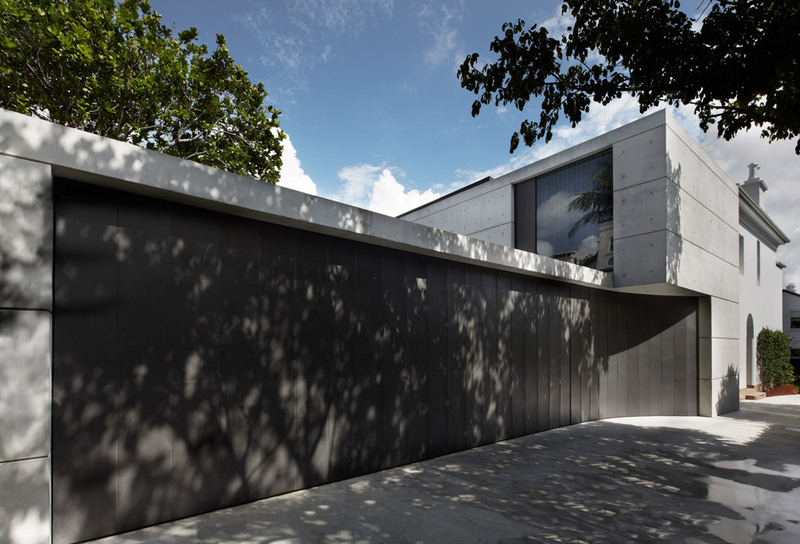 The bare concrete of the new pavilion contrasts against the white plaster walls of the old building; a large black painted steel portal divides the two and acts as a threshold. The effect of the raw concrete has been softened on the inside by hand-sawing after it had set. The end walls are used as a neutral backdrop for displaying large-scale paintings and sculptural works, which are lit naturally by two glazed walls and narrow clerestory windows. The pair of floor-to-ceiling windows frame a view through the extension to the historic residence beyond. The colour palette is predominantly white, black and grey. A lovely reminder of the house’s true age is disclosed in the front rooms where the architect elected to leave the original ceiling paint. 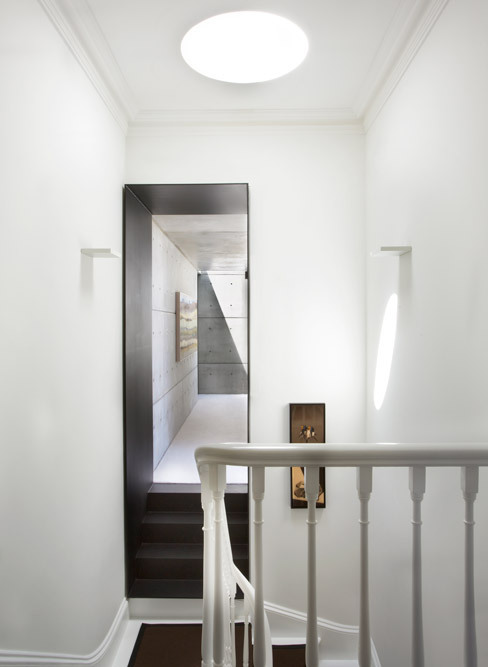 The original 19th-century fireplaces and decorative cornicing have also been retained and provide an important contrast with the clean lines and pared-back aesthetic of the extension. A guest suite positioned above the kitchen in the new extension offers garden views. It is linked to the upper floor of the original house by a balcony that looks over the dining space below. 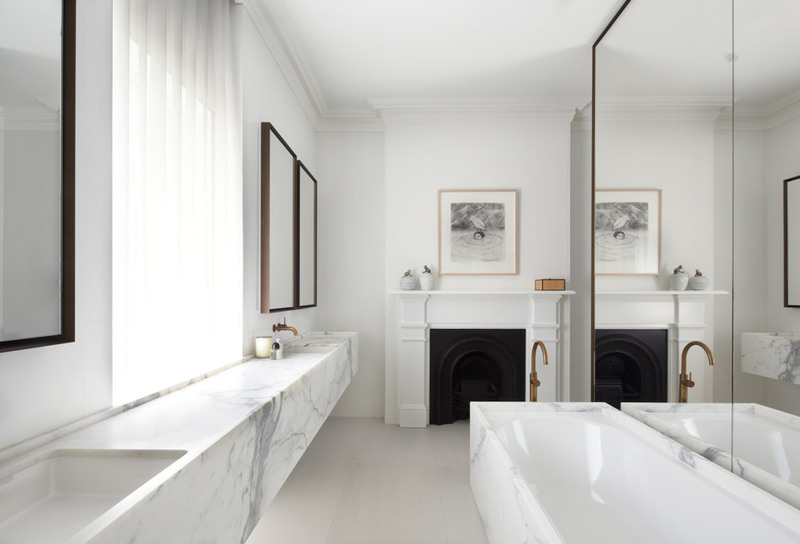 A marble sink, sideboard and a bath tub have been added to the family bathroom, which also features a mirrored wall and an original fireplace that continues on the theme of pairing old fittings with new. In the words of the architects: “Conceptually, the aim was to make a new wing of equivalent substance and quality to the 19th-century villa, but with all the skill and detailing devoted to making the structure spare and minimal, in contrast to the highly ornamented fabric of the original”. A contemporary building that suitably preserves a sense of history.